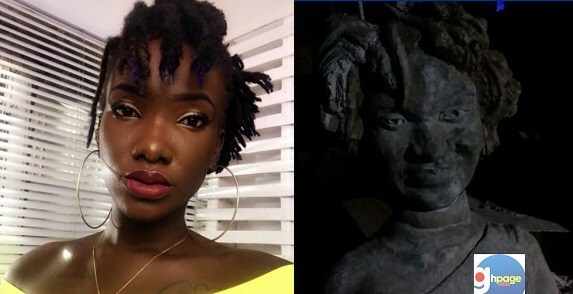 Mysterious statue of Late Singer, Ebony Reigns surfaces in Ghana. HomeAllMysterious statue of Late Singer, Ebony Reigns surfaces in Ghana. Ever since the death of popular Ghanaian singer, Ebony Reigns on the 8th of Febuary 2018, she has always been in the news. This time, it is a scary looking statue of the late singer erected somewhere in the country that is making the news. Below is a picture showing the statue depicting late Ghanaian singer, Ebony Reigns. It is not quite clear whether the statue is still under-construction, but social media fans have reacted to it with claims that it is too ugly and not befitting of the dancehall musician. Meanwhile, a woman identified as Priscilla Agyekum from Hohoe in the Volta Region has narrated a dream in which she had an encounter with the late Ebony pleading to come back to life. “I decided to have a nap in the morning, I slept off and had a dream. In the dream, I heard a cry from a distance and turned back to know who was crying, lo and behold I saw Ebony saying she will resurrect. She went on to narrate that the spirit of the late dancehall diva led her to a group of people dressed in all black and told her to inform them that her remains should be removed from the mortuary and there her spirit can come back. Ebony Reigns whose real name was Priscilla Opoku-Kwarteng, met her untimely death on the Sunyani-Kumasi road together with her bodyguard and friend. Ebony died just 8 days to what would have been her 21st birthday, her final funeral rite is scheduled for 17th March 2018 at the Independence Square.